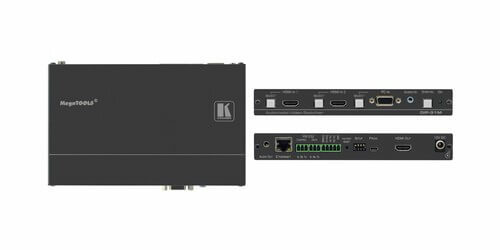 The Kramer DIP-31M is a high-performance HDMI and Computer Graphics Automatic Video Switcher that features Maestro Room Automation Software. 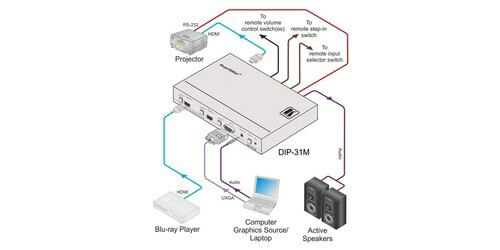 This unit has been designed to support resolutions up to 4K/60 4:2:0 and with various modes of input selection and will transmit the signal via HDMI cable to a compatible receiver (for example the Kramer VS-62H, not included, or when connecting directly to a display). The DIP-31M features Maestro software that provides powerful single-trigger, room automation functions that can automatically control the lights, projectors, displays, video sources, screens, blinds HVAC and many more. In addition to acting as a Step-in commander when connected to a matrix switcher that supports Step-in over HDMI. It also features RS-232 commands to support monitor/projector on/off. Kramer's DIP-31M offers "Maestro", an easy to configure, single-trigger room automation software that creates customized meeting room environments with minimal end user intervention. Maestro creates a series of actions based on a pre-defined event, or trigger, such as plugging in a laptop or turning a display off. These events can trigger actions such as turning on computers (via Wake-on-LAN) and turning on and off lights, projectors, displays, video sources, and HVAC. Integrated with Kramer’s dynamic database of device drivers, there is no end to the types of actions Maestro can perform. Maestro enables automated control over a variety of port types: RS-232, Ethernet, GPIO, relay, and IR. This unit is HDTV compatible and is HDCP compliant with sources that support HDCP repeater mode. HDMI support includes Deep Color, x.v Color and 3D. Automatic live input detection is based on video clock presence while automatic input selection is based on priority selection or last connected input, there is also manual input selection for further flexibility and control. The DIP-31M offers convenient control via Kramer Protocol 3000 and embedded Web pages over LAN or via RS-232 command support. The I-EDID Pro Kramer Intelligent EDID Processing is built-in and is a intelligent EDID handling & processing algorithm that ensures Plug and Play operation for HDMI systems. 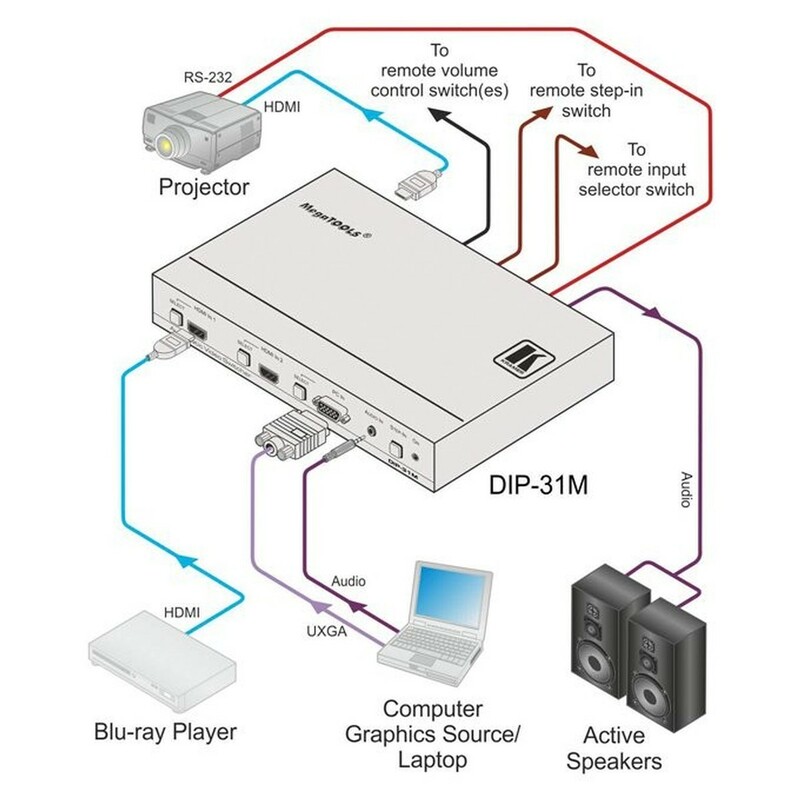 The Kramer DIP-31M is a perfect solution for display systems requiring simple automatic input selection, multimedia and presentation source selection, or in video distribution settings like in hotel rooms and schools. This device comes with its own power adapter and DisplayPort to HDMI adapter cable for connecting a DisplayPort source to the HDMI input, and is backed by a 7 year warranty from Kramer.